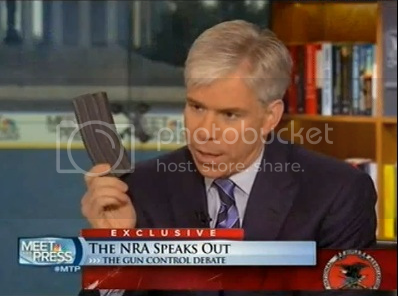 NBC’s David Gregory Breaks Gun Laws "For the Greater Good"
By now you've seen the stories about NBC anchor David Gregory breaking Washington D.C. gun laws by brandishing a 30-round magazine during his abrasive interview with NRA Executive Vice President Wayne LaPierre last Sunday. From the anchor chair, Gregory pretty much said high capacity magazines should be banned. Now, because the possession of 30-round magazines are illegal in the District of Columbia, Gregory is under investigation by police; as he should be. Not only did he violate D.C. gun laws, but according to D.C. police [who have confirmed multiple times], he knowingly violated the law after being denied the use of the illegal magazine on the show. No person in the District shall possess, sell, or transfer any large capacity ammunition feeding device regardless of whether the device is attached to a firearm. For the purposes of this subsection, the term large capacity ammunition feeding device means a magazine, belt, drum, feed strip, or similar device that has a capacity of, or that can be readily restored or converted to accept, more than 10 rounds of ammunition. Oh but what's this? ATF coming to Gregory's defense? No wonder NBC never covered the Fast and Furious scandal. An official from the D.C. police told a member of the Federal Bureau of Alcohol, Tobacco, Firearms and Explosives that David Gregory COULD display a high capacity magazine on "Meet the Press" Sunday ... TMZ has learned. As Robert Stacy McCain points out, even if ATF did give NBC permission to possess the magazine for the show, the bureau is aiding in the breaking of firearms law. We've seen that before. Not surprisingly, mainstream media "journalists" are circling the wagons around Gregory, going so far as saying "he did it for the greater good," and "it was a prop." Some have also said the police should focus on investigating "real criminals," even though in this case Gregory would qualify as one of those criminals for illegally possessing the magazine. "David Gregory ammo nonstory may be even more of a nonstory," tweeted Jeff Jarvis, linking to one report about NBC's due diligence before the segment. Fox News's Greta Van Susteren bashed the investigation on her blog. "How much time and money is going to be spent (wasted) investigating him? Can you think of a sillier use of investigative resources? " she wrote. " I will bet my right arm David Gregory is not going to go out and commit some crime with that magazine…or that he intended to flaunt the law (if it was against the law.) At worst, it was a stupid TV stunt (and so what!) And yes, we are all capable of stupid TV stunts!" POLITICO's Glenn Thrush took to Twitter to express his disdain for efforts to hold Gregory accountable. I'm not sure if these journos are really trying to defend Gregory, or if they're simply pissed "just a blogger" over at The Patriot Perspective blew this into a national story by simply displaying a screen shot of Gregory holding the magazine above a block quote of DC firearms law. TPP also points out that even if the magazine above is a prop, it's still illegal. In the end, many in the media have admitted 30-round magazines are no big deal. With this admission, members of the media who have been pushing for a ban on high capacity magazines for more than a week now can stop with their high horse agenda for the rest of Americans who legally own high capacity magazines. NBC and David Gregory have refused to comment on the matter. Gregory will not host Meet the Press this Sunday due to a previously planned vacation.